Useful for dictionaries, restaurant menus and museum displays, too! Free shipping to the lower 48 states is included in these prices except as noted. Note: Shipping cost will be deducted from any returns in addition to restock fee on items shipped free. Florida sales tax is charged for music stands shipped to addresses in that state. Call us to check availability of these stands. At times these may be out of stock, and there is a wait for new shipments. 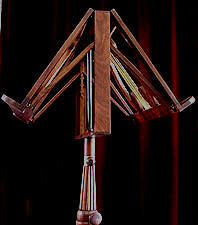 We show this music stand in sheesham wood at left (formerly called rosewood). It is also available in red cedar (see below). This new wood is a lighter red than the sheesham. Assembly of this stand is simple, according to our resident engineer. 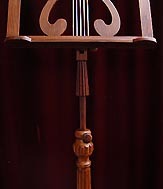 We show this music stand in sheesham wood at left (formerly called rosewood). It is also available in red cedar. This new wood is a lighter red than the sheesham. Our resident engineer says it's no problem to put this stand together. Comes with instructions. Shown in the new red cedar at left. Also available in sheesham, formerly called rosewood. The photo at left shows this stand with the desk raised about six inches above the minimum height; there is a pole inside the column that goes up to the desired height and is tightened in place by a wooden knob. Shown in sheesham wood (formerly called rosewood). Our supplier does not yet show this in the new red cedar wood. Shown at left in sheesham wood (formerly called rosewood). Our maker does not yet show this stand in the new red cedar wood. This stand is shown at left in the new red cedar wood which is lighter red than the sheesham. It is also available in the darker red sheesham wood (formerly called rosewood). You are on the music stand page of the web site www.harpanddragon.com . below to see an outline of this entire site.